With Monday being Martin Luther King Day, lots of people had the day off work and that was evident on the roads. Traffic moved at lightening speed all across the metro without much in the way of delays or crashes. At present, there is one wreck on the system. 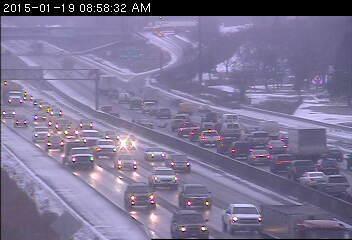 A left-lane blocking crash on westbound I-494 approaching West Bush Lake Road in Bloomington is bringing traffic to a crawl. Earlier the State Patrol responded to a rollover crash on eastbound I-94 at Hwy. 61. That occurred just before 5 a.m. The only other crash of note was a vehicle that got caught up in a center median barrier on southbound 35W at County 23 in Lino Lakes. Later today, look for possible traffic disruptions on University Avenue from Snelling Avenue to the State Capitol. Black Lives Matter has a march planned for 1 p.m.